Alsager Gardens Association is a non-profit membership association of gardeners in the Cheshire town of Alsager. 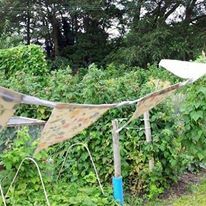 We manage four allotment sites on behalf of Alsager Town Council. Members and Partner Organisations can rent allotments, or an Accessibility Raised Bed, in sizes to suit plot holders needs. We aim to provide equality of access and a learning environment to all abilities and ages and promote gardening and allotmenteering and the benefits it brings to an individual’s health and well being. We also assist our members in all matters tending to promote the good management and cost-effective cultivation of all gardens. Do you Want to Apply for an Allotment? Take a look at our Allotments Page. Our association also runs and judges the Alsager Best Garden Competition sponsored by Alsager Town Council. As with our Annual Show the competition is held annually, during the summer months, and is open to all residents within the Alsager town council area. You can find the full details on our Alsager Garden Competition page. Alsager Gardens Association also runs a trading scheme whereby members can purchase at reduced cost seeds, seed potatoes and garden consumables such as compost, fertiliser and bamboo canes. The opening times of our trading hut can be seen on the right hand side of each page, with more details available on our Trading Hut page. It has in the past organised coach trips to gardens and shows, and put on talks on aspects of horticulture, and might do so again in the future if their is sufficient demand. Why Don’t You Become A Member? If you are keen to join us, you can find details on membership on our Membership page or if you have specific questions, view our Officers page for individual contact details.